Having trouble with your washing machine? Try these fixes, then call Master Plumbing! You’ve waited all week while laundry piled up in the hamper for laundry day, and now that it’s here your washing machine isn’t doing what it’s supposed to. 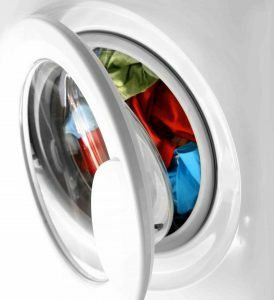 Instead of running out to the laundromat right away, try these quick fixes to see if you can get your washing machine working again. If you are still having trouble, remember that Master Plumbing is only a call away! An unresponsive washing machine is incredibly frustrating, as you have no idea what the problem is. First, check to make sure that your washing machine is plugged in. If you have an old washing machine that rattles and rocks while it does its job, electrical plugs can actually work their way out of their own outlets. Next, check the breaker box for your apartment or home. If the circuit breaker was tripped, put it back into place and watch your washer complete the cycle to ensure that there isn’t a bigger electric problem with your home. Last, take the time to check the water valve that is leading to the washing machine. Sometimes a clog will get in the way and stop water from entering the machine. If the washing machine itself is working but the drum isn’t moving, you should check the belt that is located at the base of the washing machine drum. Over time, the belt can slip out of its proper placement or break altogether. Look at the manual for your washing machine to see how to access the belt. Most of the time, all it takes is a screwdriver to open up the panel and examine the belt. If the belt needs repair, you can give the plumber a call and have an exact fix already in mind. If water is still sitting in the drum of your washing machine at the end of the cycle, there is something blocking the drain line for the machine. Did you leave anything in your pockets? It might be the cause of the problem! Disconnect your washing machine from the power and use towels and a bucket to empty the basin. Look through the hose and blow through the line to clear it and use your washing machine again. This entry was posted on Friday, June 30th, 2017 at 3:04 pm. Both comments and pings are currently closed.